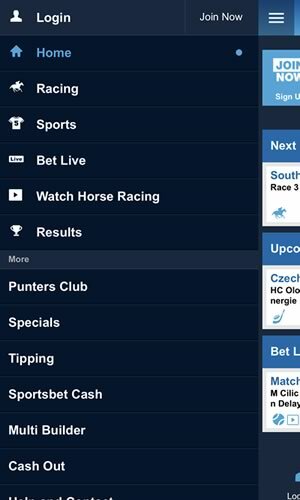 We now recommend Australians use the William Hill betting app. Wager live or in-play on Aussie Rules, cricket, rugby, soccer and horse racing. Use mobile exclusive "Power Play" to boost your racing odds on 1 race per day. 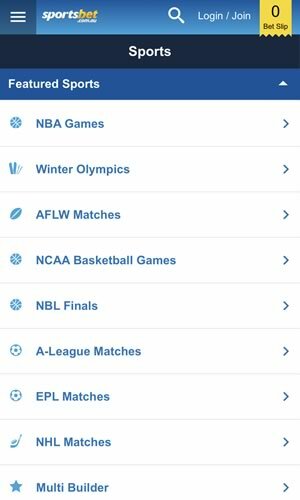 Take part in AFL/NRL tipping competitions or create betting clubs on your phone. Advanced horse racing form guide with live Melbourne/Victoria racing streams. 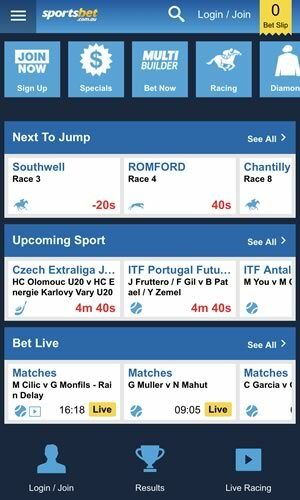 ​Combine your bets into multi-bets easily from your iOS, Android or Lumia. SportsBet is a homegrown Australian online sportsbook that need no introduction to punters down-under. They have developed one of the most innovative sports betting apps for wagering on horse racing and sports throughout Australia and the world. In addition to the regular sportsboook features you would expect to find in any iOS or Android betting app, SportsBet Mobile also offers these noteworthy options. Sportsbet offers some very interesting horse racing features as well. They offer short form content for quick and easily digestible looks at every horse, including data and graphics to help you make informed decisions on each race. There is also longer form content available, including detailed histories for each horse in every race, right down to race-by-race information, for those who want to do deep dives on prospective horse racing betting picks without having to jump from website to website to do so. This is another example of an iPhone and Android sportsbook being more than just a place to wager. There is a great social component available at Sportsbet as well, that being their Punters Club. Users can create their own punters club and invite their friends in, where players will pool funds from their individual accounts for use with the club. Club admins can set rules as to the wagering within each club, and players within each club take turns betting as they look to build a bankroll as a team. This seems like a lot of fun, and makes talking about betting with your buddies something you can do from their platform rather than having to run off to a social networking app instead. Another perk for horse racing bettors is Sportsbet's Power Play. Available to be used once per day on Single Fixed Odds Win Bets, Power Plays can be used on thoroughbred, harness, and greyhound races. What the Power Play does is increase the odds on a racer of your choosing, making them more favorable than they would be without the Power Play. While betting on a horse in a normal wager is exciting, the thrill of wanting to make your Power Play count aims to amplify that experience, and does so successfully. As far as live streaming goes, Sportsbet has its players covered with live streaming of Victorian thoroughbred racing, as well as live streams of other select sporting events. To access these streams, players must have a funded account. The Sportsbet multi-bet builder is a convenient tool for putting together a multi-bet, while vastly reducing the number of clicks you have to make to assemble your wager. Users can fire up the multi builder, and navigate between sports from the top of the builder. They can then select the teams they want to include in their bet, see the odds change based on their selections from the same screen, and then access their bet slip once they are done. For those who need to make a deposit quickly before a game that a player wants to bet starts, Sportsbet has added a quick deposit feature, which gives players the ability to make a deposit and place a wager from the same screen. That is a nice touch, as countless sports bettors have felt the pain of trying to make a deposit quickly enough to bet on the day's big game, only for the deposit to take too long and for the game to have started before they could pull the trigger. Sportsbet's design is clean and responsive to iPhone and Android sports betting devices, as well as tablets. Where the design of this site shines brightest is in its horse racing graphics, which look clean and easy to interpret data from without being too basic looking. There is also the option to filter out betting markets by how close to the present time they start, which makes navigating the site for what you want to bet on a little easier, especially if you are looking to wager on something ahead of time in a sport that is played daily such as the NBA. In-play visualisations and live statistics make following your wagers enjoyable as well. 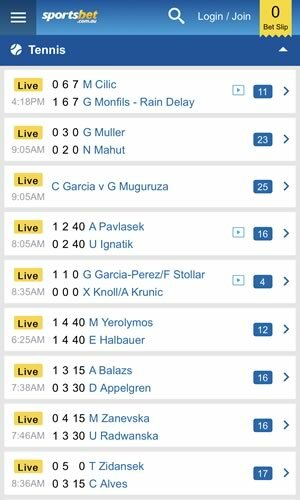 Betting markets are robust on Sportsbet Australia's mobile app. In addition to the usual suspects in Australia of AFL and NRL, they offer a wide array of American sports such as the NFL, NBA, and MLB. They also offer sports that are more popular outside of the Australian and North American markets, including table tennis, snooker, and handball. With so many mobile sports betting apps out there, versatility is a must for any sportsbook in this day and age, and Sportsbet provides that in its markets. Placing an in-play bet is easy with Sportsbet. Their Bet Live section offers action on an impressive amount of in-play games, from more in-demand matches in the NRL and AFL to things like Swedish U-21 soccer. All you have to do is select your match, choose a market, make a selection, and enjoy. Being a mobile sportsbook no longer just means being a place where players can bet on sports. With so many apps having additional features that make them worth visiting, it is essential not to be a basic sportsbook to stay competitive in the industry. Sportsbet, with their $1,000,000 tipping competition and their superbly social Punters Club, seem to understand this very well, offering their players well beyond the wide array of betting markets that just about every iPhone and Android sportsbook has these days, and that is commendable.